Nutella Iced Coffee is a soothing combination of coffee, Nutella, milk and all things good! It is super chilled, chocolaty, milkish and delicious. Here is how to make this delicious Nutella Coffee Recipe at home. Waking up early every morning, exercising and cherishing the good things and simple joys of life is something that I always look forward to! Add to that accompanying the aforesaid with a cup of Adrak Wali Chai or coffee and you know your day couldn’t get a better start, right? But, for my kiddo, mornings are a bit different – after all who loves going to school in the pink cold, eh? To cheer his mood up, I often surprise him with his favourite meals or beverages like Pumpkin Pie Smoothie during breakfast or pack something as delicious as Grilled Vegetable Cheese Sandwich. But today, he was really feeling all the more gloomy and that’s when Nutella came to my mind – guess what, I ended up making Nutella Iced Coffee to perk him up and it did the magic like nothing else! Leave alone my sunny boy, even I and my husband loved it and it is going to be made on repeats for sure. I am soon going to make Nutella Hot Coffee for the cold winter mornings and I am sure it will taste as good. If you are a die-hard Nutella fan then this Nutella Coffee is a must-try, people! 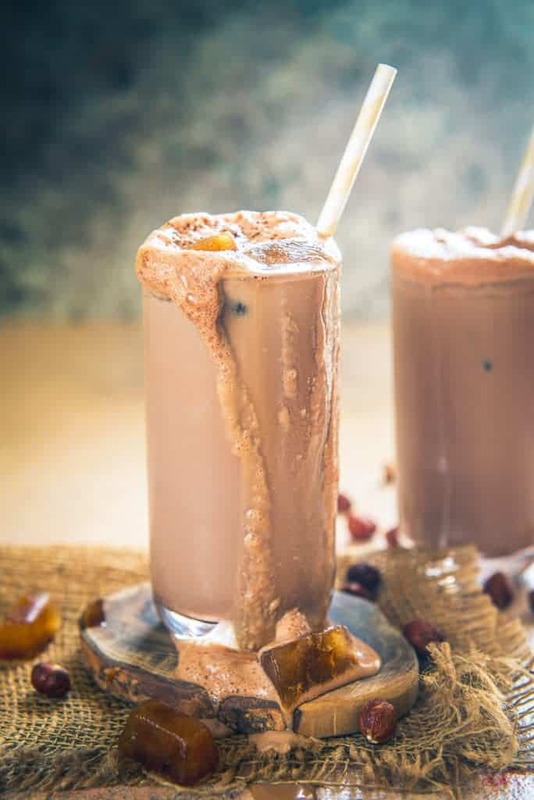 Without much adieu, here’s my recipe for making luscious Nutella Iced Coffee, do scribble down the Nutella blended coffee drink recipe and your feedback is awaited! You can increase or decrease the amount of instant Coffee powder as per your liking. If you like strong coffee add some more and if you like light, reduce the amount. Brew some coffee and freeze it in ice tray. Now use these coffee flavoured cubes for your Nutella Coffee. Using these will not dilute the flavour of your coffee. 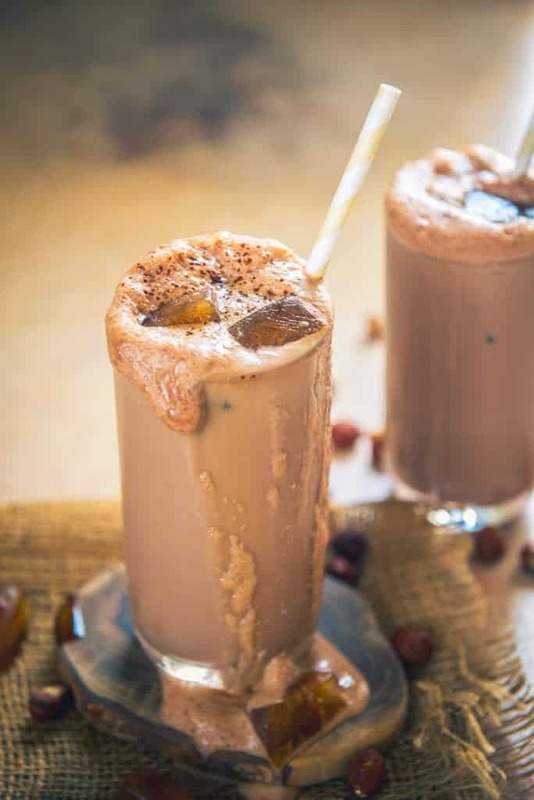 You can also top the glass with some whipped cream or vanilla ice cream and sprinkle some chopped roasted hazelnuts on top if you want to make this drink more extravagant. Make a hazelnut sauce by mixing Nutella with some milk so that it reaches a saucy consistency and drizzle this sauce over the whipped cream or vanilla ice cream if topping the glass with these. Nutella Iced Coffee is a soothing combination of coffee, Nutella, milk and all things good! 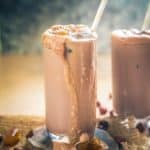 It is super chilled, chocolaty, milkish and delicious. Here is how to make it. Add instant coffee powder, milk, Nutella, sugar and vanilla extract in a blender. Blend well to make a frothy coffee. Add ice cubes in glasses. Pour the coffee over the ice cubes. Wooww!! it’s yummy. After seeing your images I can’t wait to make this recipe for my daughters and I think they loving it. I have a question can I add orange extract instead of vanilla extract, because my daughters don’t like vanilla flavor. This really sounds delicious and I will definitely try it out. You can skip adding vanilla extract but I am not sure how orange will pair with Nutella in this drink.